The Primary Care Collaborative Cancer Clinical Trials Group (PC4) and the Primary Care Cancer Research Group recently tied on their aprons for a good cause. 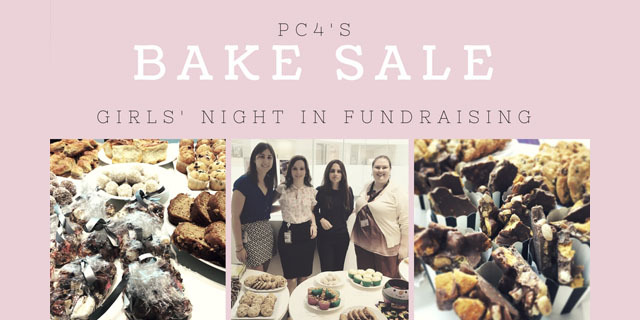 The team had a morning tea Bake Sale fundraiser at the VCCC for the Cancer Council’s ‘Girls’ Night In’ and sold everything from Asparagus and Fetta Quiche to Rocky Road and Bliss Balls. The icing on the cake was raising over $350 to donate to such a wonderful cause. Thank you to our brilliant team and all those fabulous people who supported the initiative and made the Bake Sale a success. Girls’ Night In is a fun, easy way for women to raise funds and awareness for women’s cancer research, prevention programs and support services.